Zend Technology introduced a new cloud technology platform for the creation as well as deployment of the PHP applications on the other various clouds and it is based on the server as well as architectural framework of the zend. 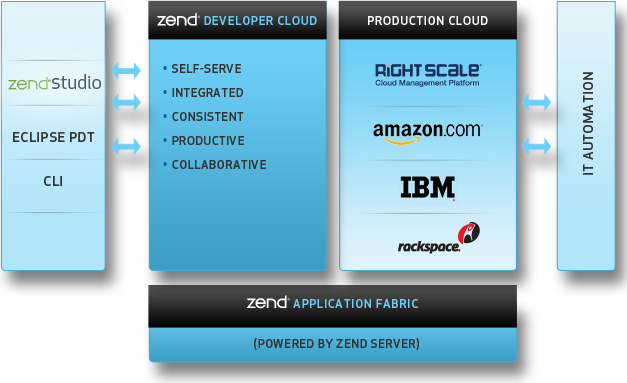 It comprises the Zend developer cloud and Zend App fabric. Zend Application Fabric mainly used in the services such as tracing of codes, caching, hot fixes and support, to name a few. It is also used for improving application response times and minimizing resource utilization. Benefits of Zend PHP Cloud Application Platform are reduction of cost, portability across several different clouds, high availability as well as high performance of the applications and streamlining of the creation, testing as well as deployment process. Zend Developer Cloud used a cloud-based environment for developing your apps means that you can easily share your code with co-workers, friends and users. Zend Developer Cloud also enables you to take snapshots of your application stack and have a team member join the project from exactly the same place you are at. And, Zend Developer Cloud is integrated with Git to help you manage your source files, so you can easily collaborate with your team members at the source code level. If you are ready to push into app live, because you have already developed on the Zend Application Fabric, you can run on any of the cloud services that support the Zend Application Fabric, such as Amazon and Rackspace. Using the same application platform in development, testing and production means deployment will be frictionless and quick. This entry was posted in Open Source, PHP, Tech News by admin. Bookmark the permalink.